In 1898 and 1899 the first notes on training places of Karate in Okinawa appear in newspaper articles. From these early descriptions it can be seen that Karate was taught in the context of political activity and ideology. In the earliest case (1898) Karate was taught by a member of the former Anji class, that is, a member of the royalty in Shuri. This man had stayed in China for many years as a royalist fighting for the restoration of the Ryūkyū Kingdom. He is also said to have employed teachers “of doubtful origin” and taught various other Chinese thought to school kids in his private home in Shuri. In another case (1899) it can be seen that the Karate instructor demanded fees for his instruction; the amount is described in the article. This instructor lived in Kume Village of Naha. He was described by the newspaper as a scoundrel who teaches brawlers and ruffians. This is also the earliest case we actually read about what is called kakedameshi, i.e. a “contest of old style sparring”. From this last fact alone these are important historical materials that must not be neglected in the historical study of Karate. Both the above training places – one in Shuri, one in Naha – were open to exclusive members only and closed to outsiders. In this sense, this was a kind of “secret training” we so often are told about. Now there’s one thing that should be borne in mind: The media at the time was more or less slave to the political authorities. Therefore, the two above mentioned articles and their extremely negative tone might be regarded as semi-official attempts of character assassination by help of the media: Obviously both the above noted Karate schools were considered enemies of the political establishment of Shuri, an establishment who by that time had already completely succumbed and assimilated to Japan, knowingly or not. 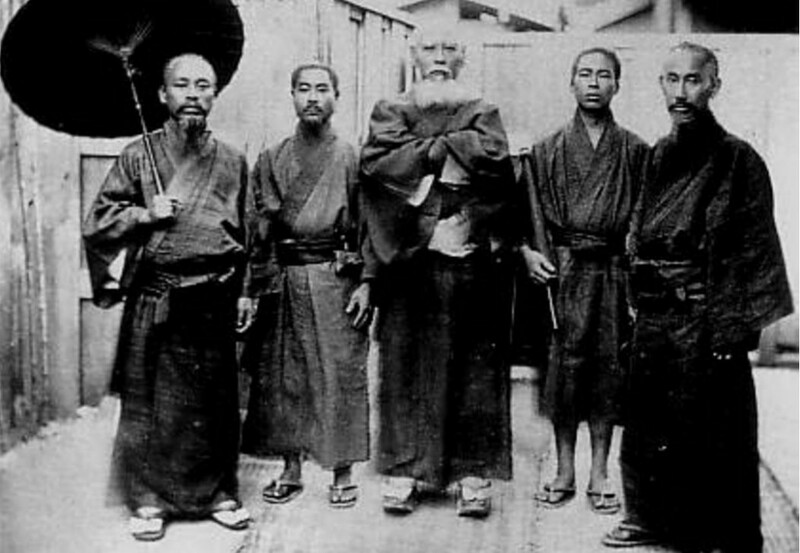 Meiji era Ryukyuans: Can you tell which side they were on from looking at their faces? Picture source: Wikipedia. I therefore wonder if the designations of “Naha-te” and “Shuri-te” are merely retrospectively harmonized divisions of what was in fact a division in political ideology. In hindsight we get a picture of a unified Karate movement from day one. Just as in official state histories, where a ruler is always portrayed as the rightful and just heir, with the blessings of heaven, when in fact he was just the usurper of the throne. Seeing it from this perspective for a moment, the descriptor “Naha-te” might in fact be a retrospective name for the karate of the “school” of the political opposition. That is, those old royalists and those who raised some forlorn hell against the unconditioned assimilation of Okinawa. On the other hand, “Shuri-te” – excluding old-style Suidī, which was something different – might be considered the “Japanese faction” among the Okinawans who obviously fully supported expansionism, colonialism, and militarism. It is no wonder that it had been supported by government ministries and authorities, media, and financiers. Just remember that none of the so-called “Naha-te” kata made it into Itosu’s syllabus of educational Karate. Or in fact, “conscription-agers Karate”. In any case, Karate was assimilated anyway from the 1910s onward, step by step. In fact, the incorporation of heretofore undiscovered Okinawan Karate systems continued in the postwar era and in fact to this day. You will find the above mentioned newspaper articles translated for the first time into English in my work “Karate 1.0” (2013, pp. 334-39). This entry was posted in Book Reviews, Unknown Ryukyu and tagged Karate, KARATE 1.0, Naha-te, Okinawa, Shuri-te. Bookmark the permalink.